Zameen Developments (Pvt.) Ltd is the real estate development arm of Emerging Markets Property Group (EMPG), the parent company of Zameen.com, and other vastly successful portals in the MENA and South Asian region. Working in sync with its prestigious sister company, Zameen.com, and utilizing the specialist knowledge collected by the extensive network of its parent group, Zameen Developments is set to become an immediate game-changer in the sphere of vertical real estate development in Pakistan. Over the years, Zameen has become a name synonymous with quality and reliability. The city’s major arteries, such as Canal Bank Road, Lahore Ring Road, and Khayaban-e-Jinnah, are only a few minutes’ drive from Zameen Opal, which offers easy access to multiple commercial hubs. It is also close to many recreational facilities, hospitals and educational institutions - ranging from primary-level schools to universities. For residents, the project offers a unique living experience in one of the fastest developing and most-sought-after neighbourhoods of Lahore, i.e., Raiwind Road. 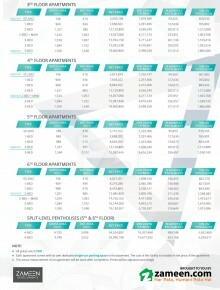 The unique facilities, amenities and architectural beauty of the project are a culmination of Zameen Developments and Zameen.com’s vast experience in the field of real estate development, sales, and marketing – based on feedback from thousands of satisfied end users and the latest market research info geared towards creating the perfect community living experience. 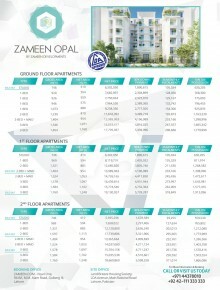 Operating in the real estate market for more than 12 years, Zameen.com is a name that enjoys the trust of property consumers based across Pakistan and other regions of the globe. We have sold over 1,500 apartments during the last year, ranging from high-end luxury apartments to more affordable property units to cater to the different sections of the market. Area: 554 Sq. Ft. - 680 Sq. Ft.
Area: 1,071 Sq. Ft. - 1,160 Sq. Ft.
Area: 954 Sq. Ft. - 1,053 Sq. Ft.
Area: 594 Sq. Ft. - 610 Sq. Ft.
Area: 1,102 Sq. Ft. - 1,248 Sq. Ft.
Area: 3,496 Sq. Ft. - 3,552 Sq. Ft.
Zameen Developments (Pvt) Ltd is the real estate development arm of Emerging Markets Property Group (EMPG). It represents the culmination of the company’s expertise, knowledge, and financial capital, and is expected to usher in a new era for real estate development in Pakistan. Working in sync with its prestigious sister company Zameen.com, and utilizing the knowledge collected by the extensive network of its parent group EMPG, Zameen Developments is going to be a game-changer for the country’s real estate sector. Setting the trend of high-quality vertical development in Pakistan, 1,500 apartments have already been sold through its sister concern Zameen.com. With its experience, data-driven approach, and extensive reach in the property market, Zameen Developments adds just the right touches to its ongoing projects and takes stock of everything from the ground up. It has successfully sold over 30 projects in the country, and continues to use modern techniques to develop effective and sustainable business ventures. Zameen Developments has helped projects assemble productive inventories, design unique construction concepts, and price their products effectively, among a host of other services. Each project is first conceptualized through extensive research and analysis. A thorough assessment of the end-user experience, financial viability, legal validity, and sustainability backs each of our decisions. These diligently maintained traits and commitments have proved fundamental to the success of all our projects. We provide a myriad of services encompassing the entire Project Delivery Lifecycle, and clients are free to voice & choose exactly what they need. We are the best at what we do, whether it is project research, conceptualization, financial modelling, planning & development, or marketing & sales. Each service we offer will add value to your product, and help you get the best possible returns. Research, Conception, Analysis & Feasibility, Design & Process, Project Close Marketing, Sales Monitoring & Supervision Project Development.